A house is built of log and beams … but your home is built of realized dreams. Dear André, Gary, Donna and the rest of the Staff at Pioneer Log Homes,From the moment we walked in the door, and seen our names on your welcome board, to the greeting we received when we arrived, to the warm and very informative meeting with Gary, we knew we had found what we were looking for! There are really no words that can describe what a person feels watching those logs come of the truck and seeing them being constructed into your dream home right before your very eyes. For years we had planned this home and now it was actually happening! That is a day we will never forget as we watched your crew assemble the framework of our home. For years we had scoured log home books seeking out what it was that appealed to us, and what it came down to was that we wanted the “WOW” factor. So when we asked you for knotty and gnarly logs – you certainly were more than obliging – you exceeded yourselves beyond our wildest dreams!!!! For years we looked at those perfectly round circles on our blueprints, but had no way of really envisioning the absolute uniqueness and beauty each one possessed. Whoever picked out our logs certainly must have an amazing eye for envisioning their placement! We really wanted a unique entrance, and your log selection over the front porch certainly says it all! What a terrific welcome into such a unique home! As for the king pin in the great room – Stan is in awe with it every day! When we changed the double round off logs under the king pin to a single log, we had no idea it would create such an amazing feature – “amazing” it is!!! Again, you couldn’t have chosen a better log! It has a “WOW” factor 10 times over!!! So once again, we would like to thank everyone at Pioneer Log Homes for truly fulfilling our lifelong dream. So often this day and age, customer service is something that is often overlooked. 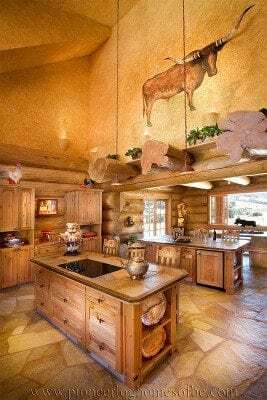 We can’t begin to express our appreciation for all the time and patience everyone in your company put into helping us create our beautiful log home.